I know what you’re thinking. You’re thinking, Hey, can it really be true that Apple alone is responsible for the frothy soaring wondrous stock market? Well, yes. It is true. And I know you’re thinking, Hey, Steve Jobs, thanks so much for doing this. For not only giving us the beautiful iPhone but also driving up the values of our 401(k) plans and making us all a little bit richer. Steve Jobs, we’d like you to have a Nobel Prize for this. Won’t you come to Finland and pick yours up? Because what does more to give peace to the world than driving up the value of everyone’s stock portfolio? Wealth equals happiness equals peace. Yes. 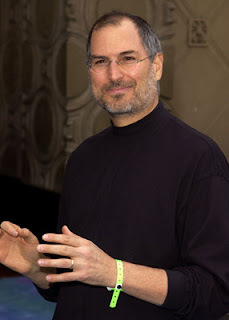 We love you, Steve Jobs. This, with the stock market, is just another way in which you’ve added a sense of childlike wonder to our lives. When we open our envelopes from Fidelity and Vanguard, and our eyes fill with tears of joy, we look then to the extra large photo of you, Steve Jobs, that we keep over our desk, and we say, Thank you, thank you, thank you. Friends, in response I say: You’re welcome.